MELBOURNE, FLA. — The Ruth Funk Center for Textile Arts at Florida Institute of Technology recently partnered with Brevard Public Schools’ Art Explorers Program to present a two-part outreach event with guest artist Marina Dempster. The project, titled “Super Heroes and the Power of Imagination,” focused on the transformative power of wearable art and the embellishment of super hero capes. The September program included a behind-the-scenes tour of the Center’s current exhibit, “Embellished: A Celebration of Wearable Art.” Dempster gave fourth-, fifth-, and sixth-grade students an exclusive tour of her work on display, and students were given the opportunity to talk about the fantastical qualities of art and the inspirations for the capes they would complete later that month during a workshop at University Park Elementary School. Dempster also designed the specialized workshop, which was presented by local artist and quilter Dij Pacarro. The students worked in teams to produce their capes using found and donated materials, and older students sewed some of the capes. Some capes had themes, including peace, the ocean and the school’s panda mascot. “I enjoyed seeing their big smiles and enthusiasm as they worked together to create their masterpieces,” Pacarro said. Todd Forschino, program development coordinator for Brevard Public Schools, said it was a great collaboration between all involved. 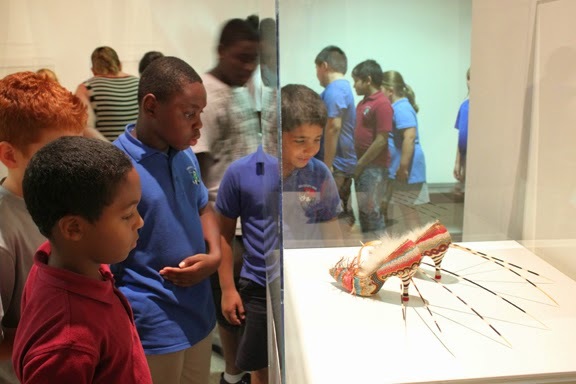 Supported by the Florida Department of Education Bureau of Family and Community Outreach, Art Explorers is a 21st Century Community Learning Center Grant which supports after school learning experiences for several Title I schools in Brevard County. The Funk Center, through a sponsorship from R.B. Case Consulting, launched its fall 2014 partnership with Art Explorers as a platform for the expansion of youth-focused community programs. Regular hours for the Ruth Funk Center are 10 a.m. to 4 p.m. Tuesday through Friday and noon to 4 p.m. Saturday. The center is next to Evans Library on the Florida Tech campus, 150 W. University Blvd. in Melbourne. Admission is free. For more information, visit http://textiles.fit.edu or call (321) 674-8313.